23 March : Veteran actor Shashi Kapoor, who has reigned and contributed to the Hindi film industry for almost five decades, has been honoured with Dada Saheb Phalke award, India’s highest honour in cinema. The veteran actor-producer, 77, is the 46th winner of the honour. Kapoor, whose performances in cult films like Deewar, Satyam Shivam Sundaram, Trishul and Kabhi Kabhie captivated the Hindi audience, is also the third Phalke award winner in the Kapoor family. 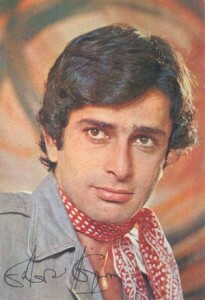 Shashi Kapoor won the National Award thrice and received the Padma Bhushan in 2011. The Dadasaheb Phalke Award – which consists of the Swarn Kamal or Golden Lotus, a cash prize of Rs 10 lakhs and a shawl – will be given out with the National Film Awards this year. The previous recipient was lyricist-director Gulzar.